Today I make time to share with you this week's "On Fire for Handmade" featured artisan, Cosmic Hippo. 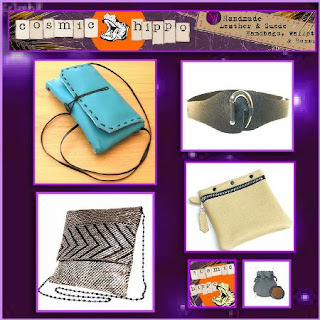 Cosmic Hippo is a designer and crafter of unique handmade leather handbags, beautifully crafted, one-of-kind works of accessory-as art. As I read her bio I was charmed that her rescue dog, Chester, acts as her muse as he sits under her desk while she works. As I browsed her studio I found myself attempting to justify the purchase of another handbag. Yeah - her work is that cool. So click on over to Cosmic Hippo to take a closer look at her unique, funky, one of a kind, affordable handmade leather handbags, visit her ArtFire Studio or Etsy shop. Thanks for checkin' it out Rue and esscentualalchemy!